Stocks dipped after President Trump announced $50 billion in new tariffs on Chinese imports Friday, escalating worries about a trade war between the United States and China. 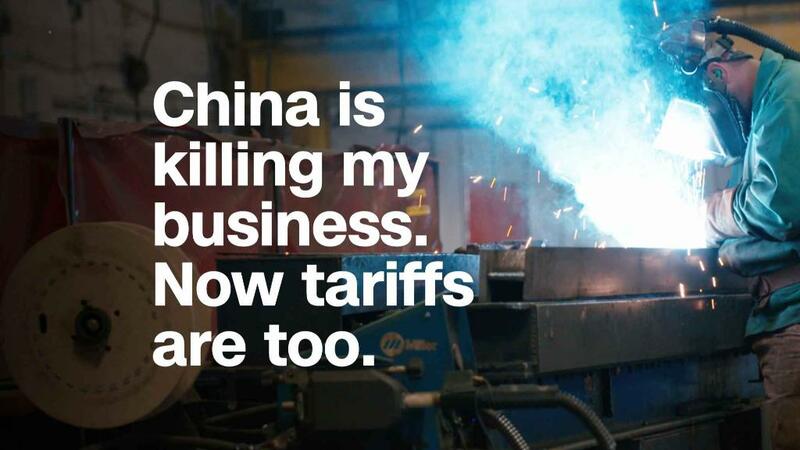 China immediately responded with tariffs of its own, which could hurt US businesses. The Dow fell more than 280 points in the morning but bounced back to finish the day down just 85 points. Big multinational companies, including Apple (AAPL), Boeing (BA), Caterpillar (CAT) and Intel (INTC) -- all of which generate a significant chunk of sales from China -- were among the Dow losers. Investors are also concerned about President Trump's trade policies with other nations. The White House has imposed tariffs on steel and aluminum imports from Canada, Mexico and the European Union. The Dow is in the midst of a four-day losing streak, having fallen nearly 1% this week. The S&P 500 and Nasdaq both ended lower Friday as well. "Volatility has returned," said Kate Warne, investment strategist at Edward Jones. "Trade disruptions could be a threat to the economy and earnings, especially since the rest of the world is not growing as strongly as the US." The US economy is humming along quite nicely. The unemployment rate is at its lowest rate since 2000 and consumers are spending the savings they are getting from tax cuts. Several economists have boosted their growth forecasts for US GDP in the second quarter. Rick Platte, chief investment officer at Schwartz Investment Counsel, said the resilience of the US consumer is a reason why he's betting on several retail stocks, despite the tumult in the broader market. He said his firm owns shares of Lowe's, TJX (TJX), Ross Stores (ROST), Tractor Supply (TSCO) and Williams-Sonoma (WSM). But the trade spats are making other investors nervous because they threaten the good thing going on in the United States. "A global trade slowdown is the biggest risk to markets. We think there's an increased risk of a sell-off this summer on renewed trade fears," said Ben Phillips, chief investment officer of EventShares in an email to CNNMoney. Phillips added that global trade has helped boost economic growth in the United States and around the world and has lifted the stock market while keeping inflation low. "If global trade reverses, expect the opposite -- lower stock prices and higher inflation," Phillips said. Still, it's worth noting that the tech-heavy Nasdaq and the Russell 2000 (RUT), an index that's home to small American companies, weren't down as much as the Dow Friday. In fact, both are up around 10% this year while the Dow is relatively flat. Some stocks with more exposure to the US economy, such as Netflix (NFLX), Costco (COST) and railroad Union Pacific (UNP), even hit all-time highs Friday amidst the broader market turmoil. Investors may be betting that the trade concerns won't slow the US economy that much, because of the tax cuts and the unwinding of some Obama-era rules on the financial, health care and other sectors by Trump and the Republican-led Congress. "It seems like it's the US against the world and that's not good. But it's not enough to derail the strong growth in the US because lower taxes and deregulation outweigh trade," said Rich Sega, global chief investment strategist at Conning. Conning noted that the US dollar has rallied sharply against other global currencies this year -- and that helps smaller American companies even as it hurts the profits of multinational firms in the Dow. And Platte wonders if all the trade bluster from Trump is still just that -- tough talk. "It's foolish to think that the US alienating trade partners would not be a risk, but I think Trump is trying to improve his bargaining position," Platte said. "I have it on my list to read 'The Art of the Deal,'" he added, referring to Trump's famous 1987 book. "There must be some method to the madness in sticking your head in the hornet's nest."